Super cheap return flights from Denmark to U.S. Virgin Islands €190! Return flights to Brazilian Amazonia from €435! Error fare? Brussels to India from €228 round trip! *see UPDATE below* Low-cost airlines Norwegian have just released amazingly cheap return flights from Denmark to exotic U.S: Virgin Islands in Caribbean. Currently plenty of travel options are available during entire main season 2016 in Caribbean. Do not miss this chance if you are looking for some not a common destination in this area. Remember that hand luggage is included in base fare only.. Round trip flights are now available for just €190 (DKK 1423)! *UPDATE*. : New opportunity for this incredible fare ahead! Just for one travel option (12-19.2.2016) you may consider to book round trip flights from Copenhagen to St. Croix for just €190 (DKK 1423). Plenty of travel options are currently available within Janury till April 2016. Please refer to below booking sample if interestedi in this extraordinary solution to this exotic Caribbean island. As this is possible glitch in airline´s booking system we recommend to book this deal the soonest..
Travel dates. Plenty of options are currently availalble. Fastest is to check directly with the airline as they offer month view. The easiest way to check your connection possibilities is using Skyscanner. Booking sample of Super cheap return flights from Denmark to U.S. Virgin Islands €190! 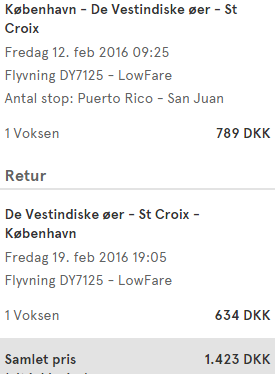 In this case you would be departing from Copenhagen to St. Croix on 12th of February. Your return flight from exotic Caribbean back to Europe would be on 19th of February 2016. That also means you may visit Carribean isle in main tourist season 2016 for this amazing fare..